The village of Ploegsteert – ‘Plugstreet’ to the British troops during the Great War – was at the southern end of the Ypres battlefields and was dominated by a huge expanse of woodland: Plugstreet Wood. The area saw fighting in the First Battle of Ypres in October 1914 but then settled down to static trench warfare and rapidly became known as a ‘nursery sector’ where units fresh from England could acclimatise to the conditions of trench warfare. Many famous people served here in WW1: author Henry Williamson in 1914, war poet Roland Leighton in 1915, and Winston Churchill and Anthony Eden in 1916. The wood was overrun in the Battle of the Lys in April 1918 and finally taken by the Hull Pals in September 1918. This image – another of the Nightingale stereo-cards – dates from 1920 and is taken on the Ploegsteert-Messines road, just south of Hyde Park Corner. 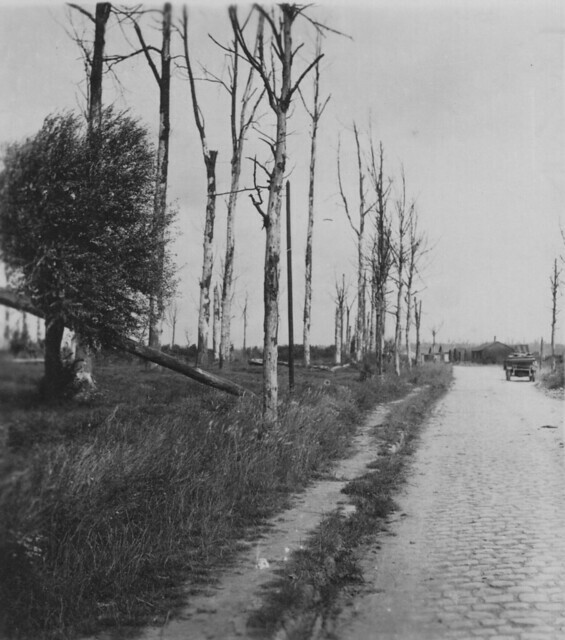 The trees on the left are the western side of the wood and show what state it was in by the end of the war. The buildings ahead are close to the site of Hyde Park Corner (Royal Berks) Cemetery, opposite which today is the Ploegsteert Memorial. The rising ground in the distance is Hill 63, beyond which was Messines and the Messines Ridge. Although not a lunar landscape like the ground immediately around Ypres, the photo once again gives an insight into the desolate state of the battlefields at this time. This entry was posted on 21/05/2012 by sommecourt. It was filed under Aftermath, Battlefields, Belgium, Flanders, Great War, Western Front, WW1, Ypres and was tagged with Aftermath, Battlefields, Flanders, Plugstreet, WW1, Ypres. Thanks for this. The road looks so forlorn.